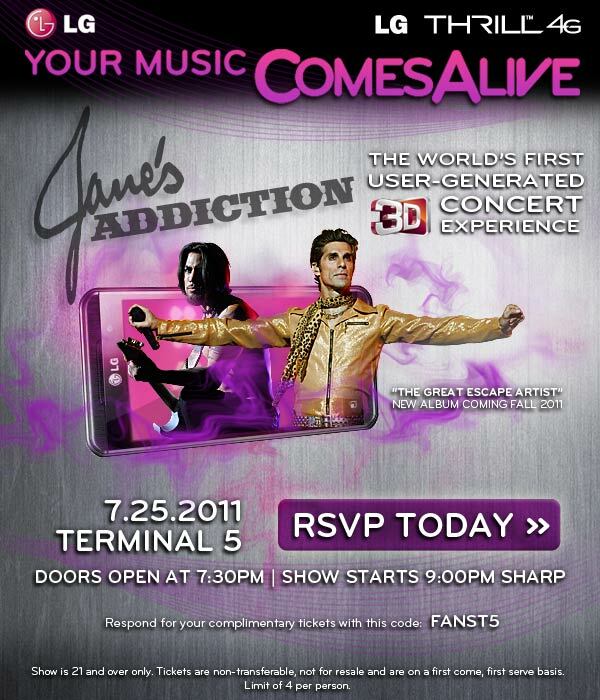 JANE’S ADDICTION will be broadcasting a live performance at the launch event for the new LG Thrill 4G phone hosted by LG on July 25th. 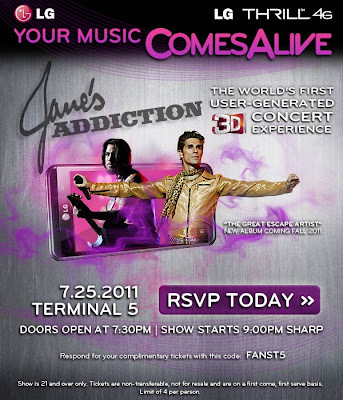 Jane’s Addiction will be performing for the private event, with fans in attendance capturing footage of the performance using the duel-lenses Thrill 4G. For fans not attending the event, the performance will be streaming live through YouTube in 2D for all to watch starting at 9PM EST. After the event, footage from the performance will then be edited into a 60-minute documentary, which will be the first 3D video to be uploaded to YouTube 3D on August 4th. Jane’s Addiction has released a video of the band in their studio recording a new song titled “Irresistible Force,” which will be on their upcoming new album, The Great Escape Artist. The video shows the band using the new LG Thrill to film each other recording the new song. For more information on Jane’s Addiction as well as updates from the band, make sure to check out their official website, www.JanesAddiction.com, as well as their Facebook and Twitter pages. Look for The Great Escape Artist releasing this fall!